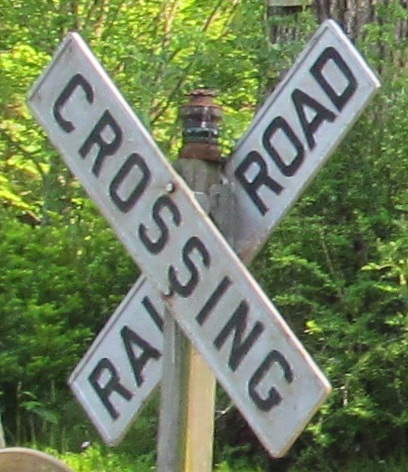 The photo above is from Mike Traverse's personal sign collection. 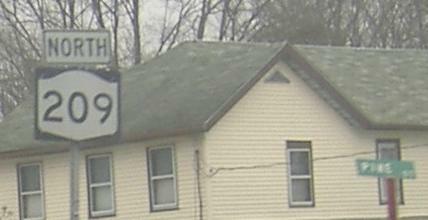 The shield may be ugly, but the sign sure is old. 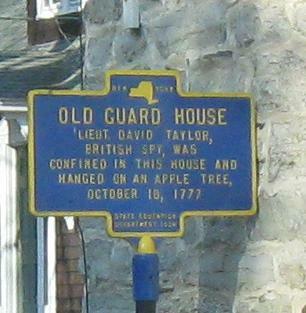 Various old historical signs, all northbound, and yes the second one is every bit as legit as the other two. I believe it's a style that was briefly tried out and then abandoned, because there are a few of them but other signs both older and newer return to the squarish look. 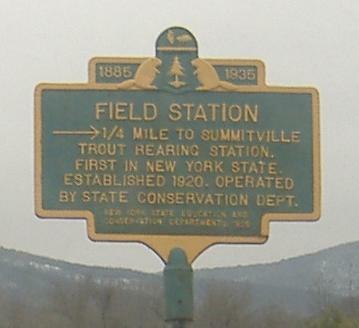 I left the blurry photo in because it's of the New Jersey claim line, which is an awesome bit of hsitory to consider (NJ wanted about another 5-10 miles of New York west of the Hudson). Across the old, into the wrong. 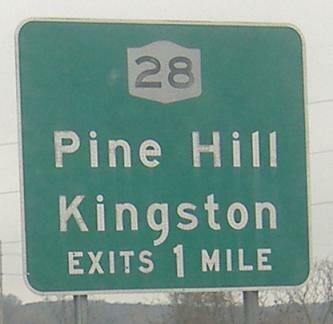 The last one is in Wurtsboro just north of former NY 17; I know this because apparently there is only one Pine Street intersecting any of US 209, at least according to Google Maps. 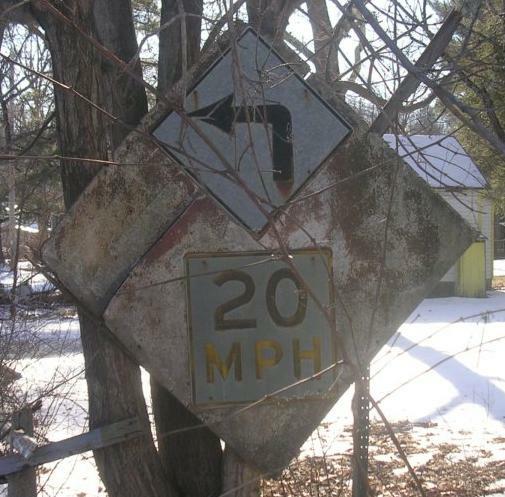 In the haste to send out all those state-name shields at once, I neglected this beautimous aged NB curve sign, with the extra-large old-style advisory speed. 1960's if you're unlucky, 1950's if you're lucky. 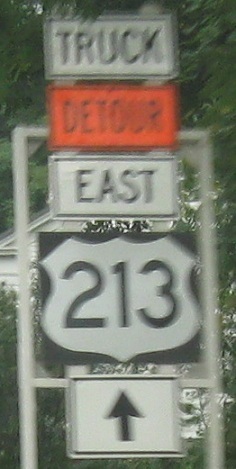 Barone Rd. 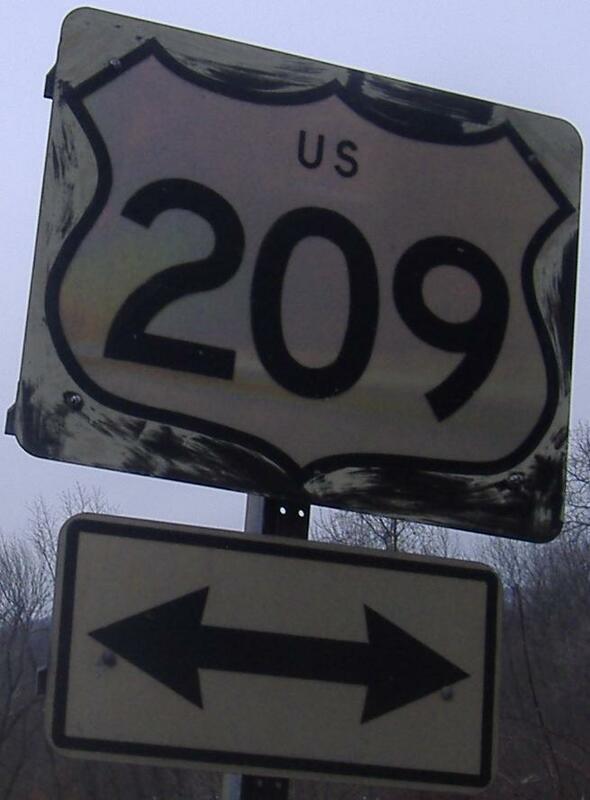 SB, old US 209 by the Wurtsboro airport, looking very much like a former concrete highway. 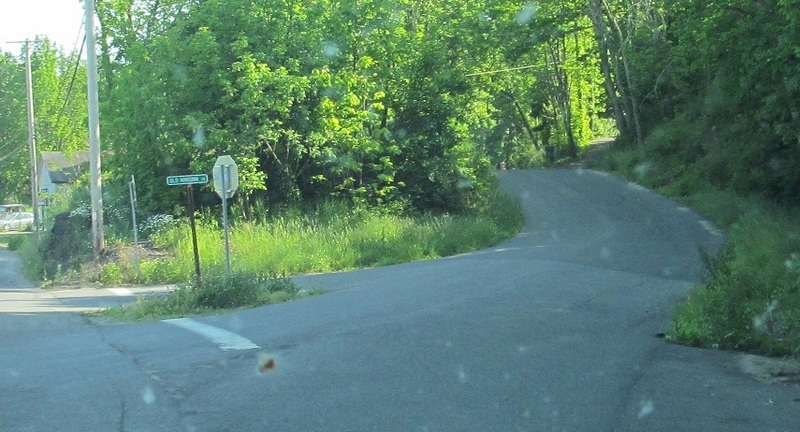 You can probably guess the name of this road from the first photo. 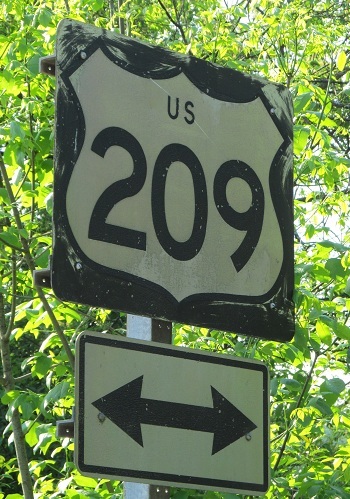 They're on a short old alignment of US 209 south of Summitville into a parking lot, where it's easy to get good photos of the old signs as well as the scenery. 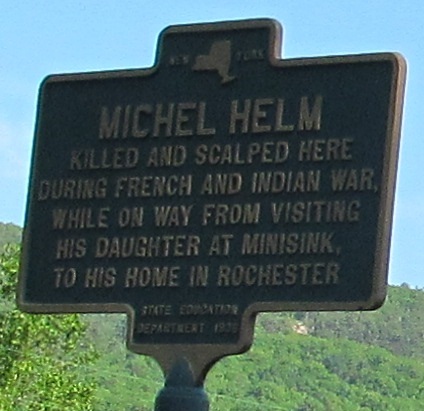 I just read the last one, and it's among the top 5 most interesting historical signs I've seen, just because of how casually it mentions gory death in passing. 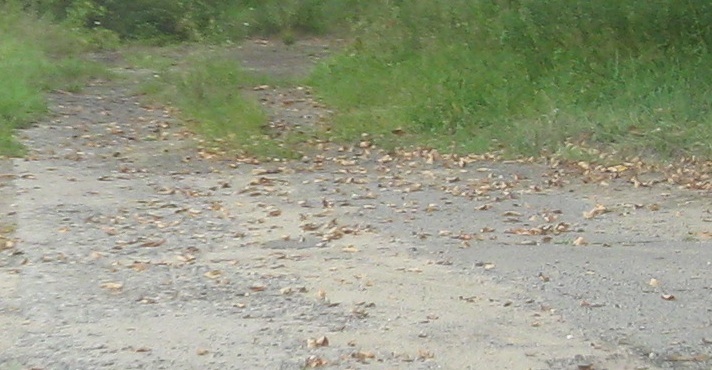 Looking back north on Old Mine Rd. (good guess!). 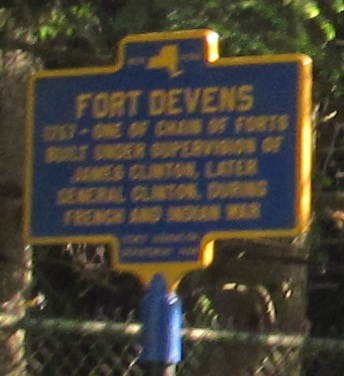 As you can see from the text at the bottom, the state again erected this one, but this time it was the Education and Conservation Commission. 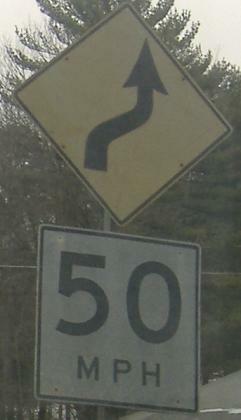 This 1935 sign is not only unique for having beavers on it, it's also green! 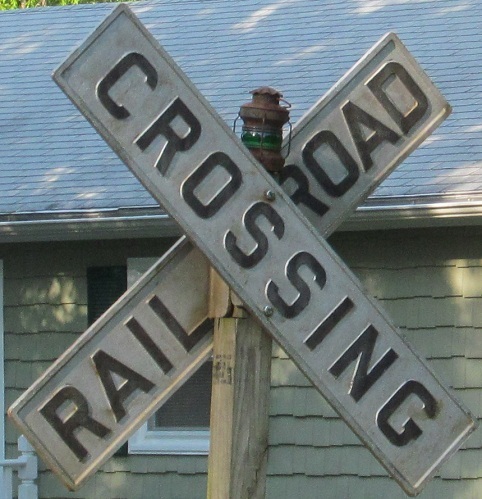 Find it at Summitville Road in the town of the same name. 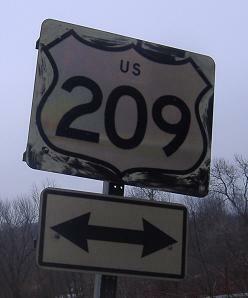 The NB and SB faces of someone's personal collection on old US 209, Philipsport Rd. 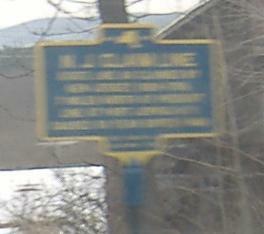 in Philipsport, Ellenville. 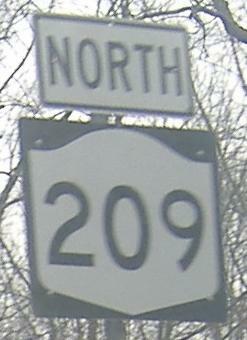 The first sign is on a very short connector from old US 209 (Firehouse Road) in Summitville and Rosa Gap and Summitville Rd. 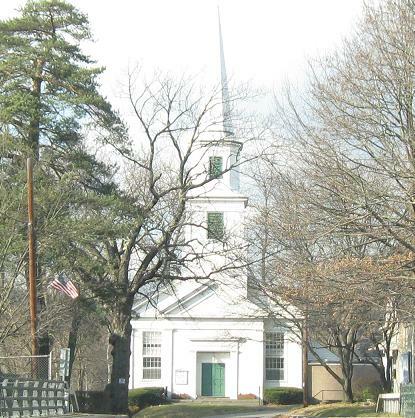 The second is on Herlings Road, a tiny dead-end. 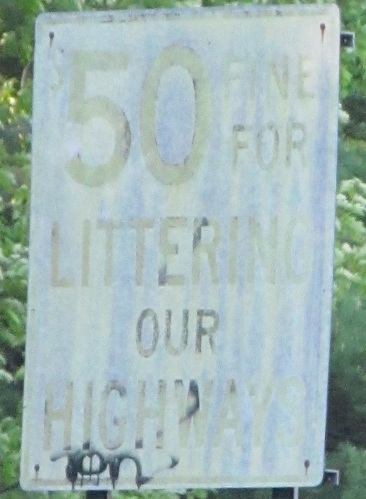 For whatever reason, both roads get a fifty-year old painted sign, so I've given both of them a closeup you can click on for fun and amusement. 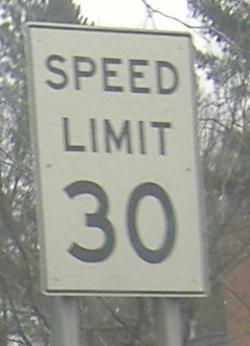 More old, more incorrect, all northbound. 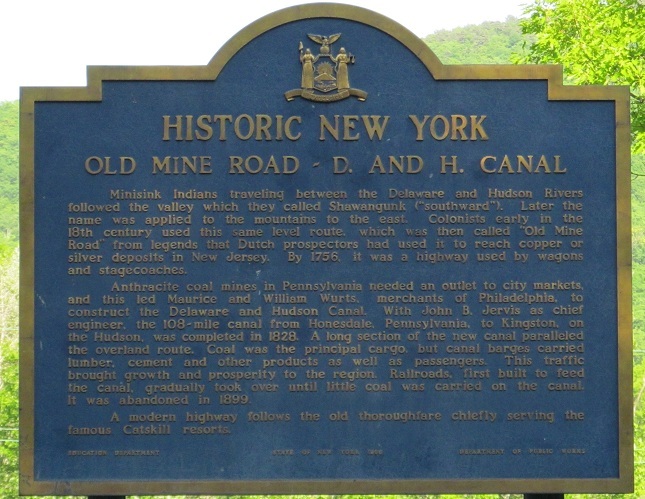 One of many old alignments, Old Minisink Trail (much older than US 209, actually), and then scenery to the east of US 209 along Shawangunk Ridge, taken SB. 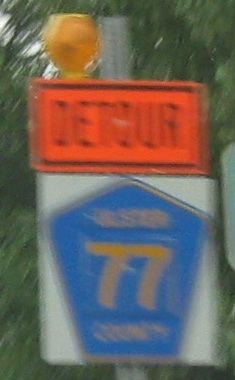 The oldest of the old, possibly the last red warning sign diamond left in the state. These wooden diamonds were erected in the 1950s to draw more attention to dangerous things like sharp curves. 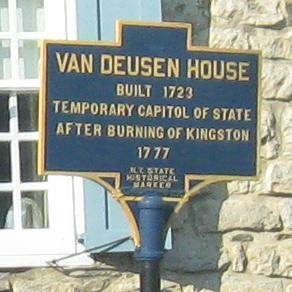 It's near Spring Glen - I won't say anything more because I don't know specifically where it is, and this photo is courtesy John Krakoff. 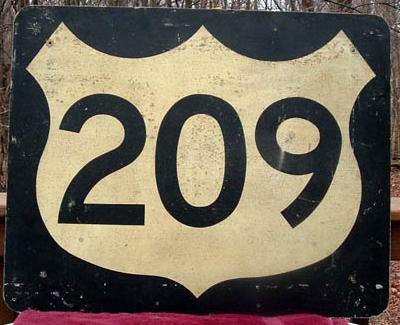 An old alignment of US 209/NY 55 NB/EB, Old Queens Highway, veers off Turkey Hill Rd. into the underbrush and disappears. 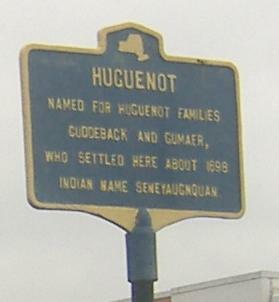 Old Queens Hwy. 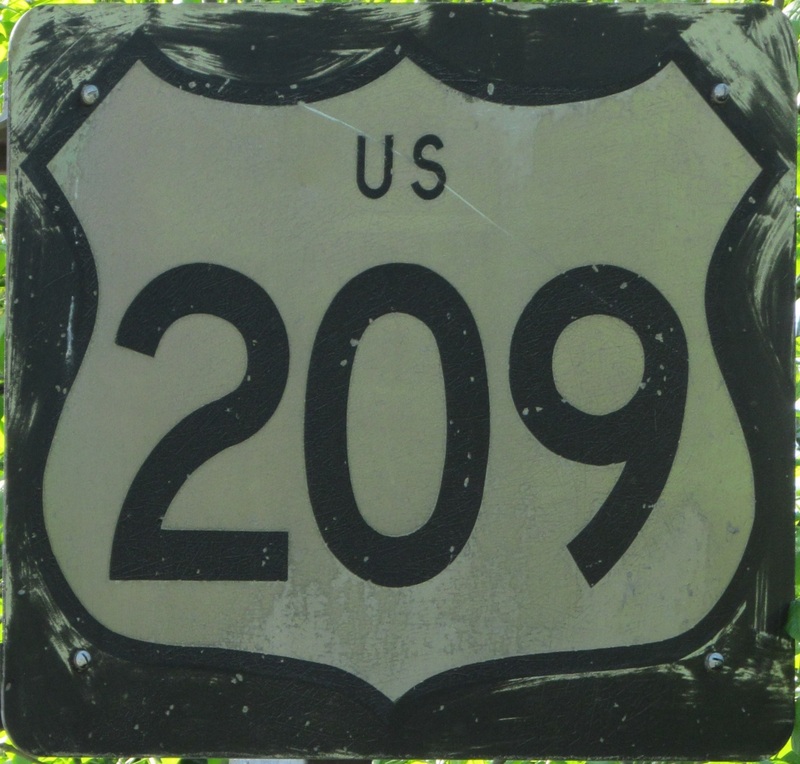 returns from the underbrush and veers back into 209/55. 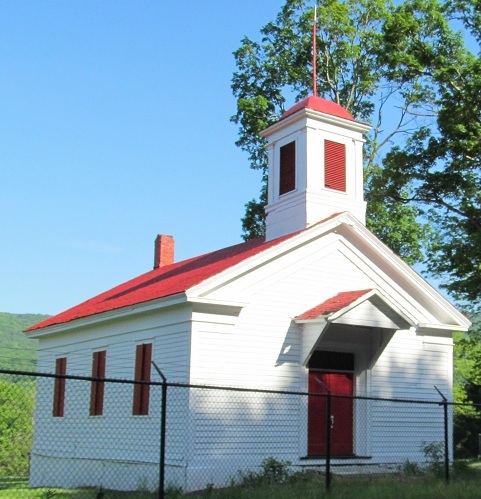 The last photo looks back southward. 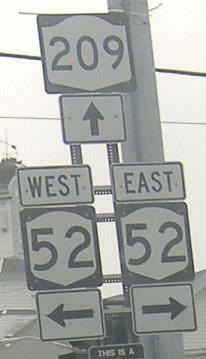 Heck, because I love you, have a few more old northbound signs, on the house, including two versions of the NY 55 split because I love you THAT MUCH (or because the older one came out better, but the newer one has a RIDOT-esque county shield). Sorry, if I actually loved you THAT MUCH I wouldn't force-feed you non-cutout shields. 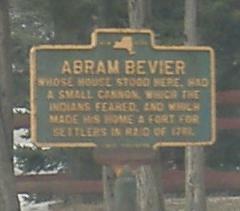 That Bevier sign reads like a poem, don'it? 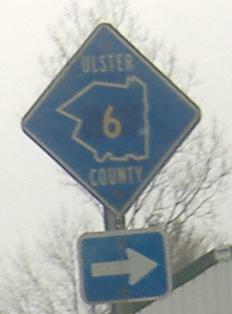 Ulster CR 6 is Kyserike Road; several counties such as Orange issue new diamond county shields with the county outline inside, but Ulster has since gone to the traditional pentagons, leaving these signs rare, especially along a major state highway. 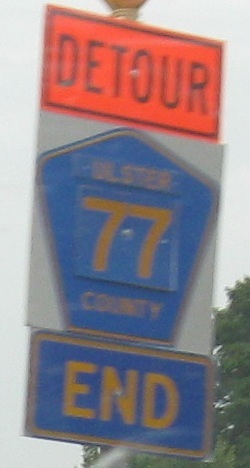 Like too many shields in southern NJ, this one has the 6 patched over some other number, or else patched onto a blank. 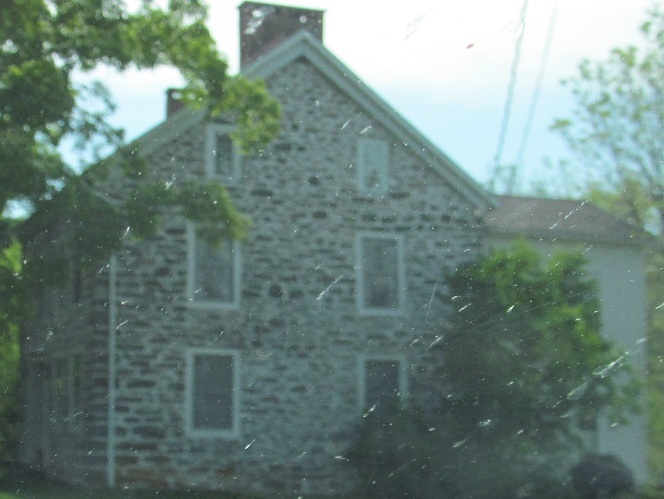 The stone house is on an old alignment of US 209, Kings Hwy. 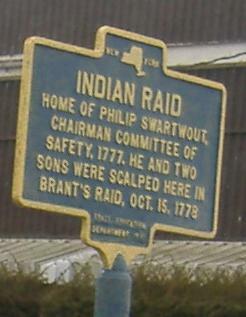 SB. 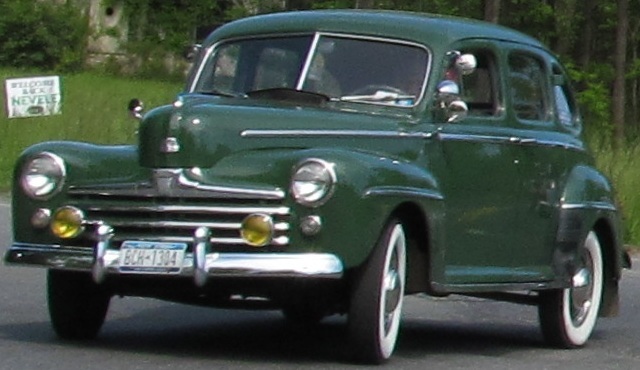 The late '40s Ford and GMC are coming in from a sharply angled road that is NOT an old alignment, Lucas Tpk. 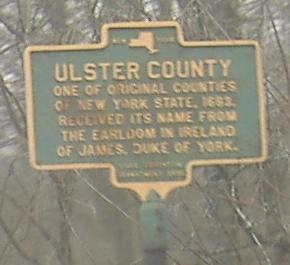 (Ulster CR 1). 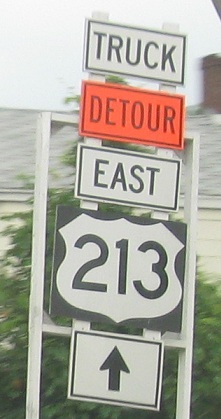 Right around that old speed limit sign, NY 213 jumps onto US 209 and back off again, but another smelly detour lingers. 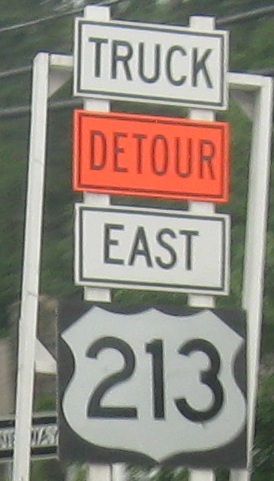 (Note that it's 213 WB that multiplexes with 209 NB, but the detour is for EB, which is entirely reasonable.) 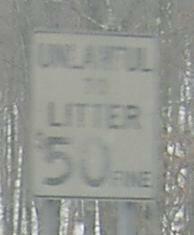 I prefer US/state errors to non-cutout errors. Well, I was asking for this with that last caption. 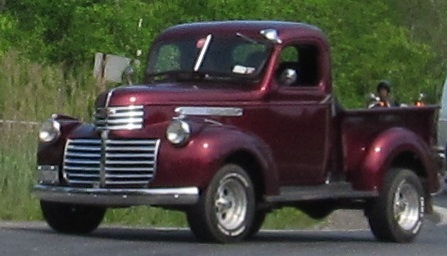 Mill Dam Rd. 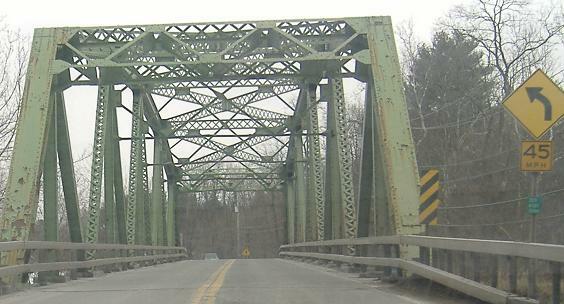 EB in Stone Ridge. 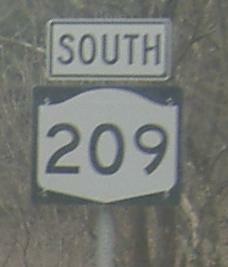 Ulster CR 29, former US 209, SB in Hurley crossing modern US 209 as it heads to the church. 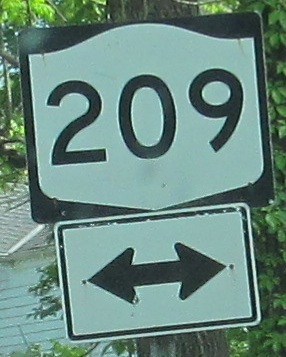 The last hurrah for this page, one last bit of button copy on US 209; there's more on NY 28, but none left on 209 otherwise. 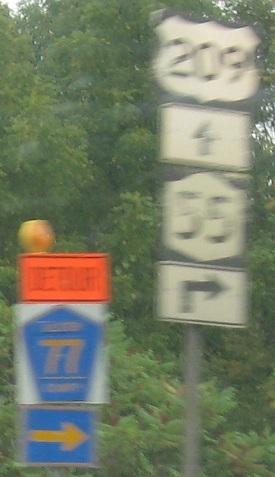 This sign is still on an undivided, unrestricted-access part of US 209, but it soon divides into the Kingston-Rhinecliff Bridge approach, where it ends at US 9W and turns into NY 199.